How to choose a good soldering gun or iron? How do I know whether the soldering gun really fits my need? Is this soldering gun worth the money? What wattage I should go for? With many brands and models of soldering guns and stations available at online stores and retail outlets, it is a challenging task to choose a good soldering iron or gun that truly serves your need. Soldering iron, we have prepared this buying guide. Here are the the things to be considered while shopping for a soldering gun or soldering iron. Soldering guns or irons need to be chosen based upon the purpose for which you would be using it. For most of the common applications such as electronics applications , hobby DIY projects, a soldering iron of 30 Watts would fit the purpose. However, for more larger jobs such as for joining large areas, a soldering gun with more wattage would be needed. Wattage of such soldering guns usually range between 200 – 400 watts. 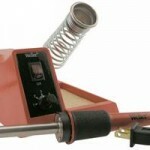 Soldering guns for larger jobs are designed like a drilling machine with a trigger made available for heating the gun. Deciding about what wattage you need for your soldering requirements is one of the very common confusions people usually have. Answer is simple. It’s temperature that is important , not wattage. For delicate jobs such as soldering a PCB, it is very important to apply right amount of controlled heat through the solder tip, so go for a soldering iron which has adjustable temperature controls. Again, wattage comes into picture when more power is required for soldering jobs. More the power, higher will be the heating temperature. Read this detailed post on deciding about how much wattage you need in a soldering gun. Soldering irons come with provision of using multiple tips (bits) so that user has the flexibility of applying right amount of heat on different sized objects being soldered. See that the soldering iron has this option of supporting multiple tips. Like any other tool, there are various makes of soldering guns and irons available in the market. Both branded and unbranded. While unbranded might be cheap, they usually tend to cause problems during long run (sometimes even in short periods after buying). It’s better to invest little more money and get a branded soldering gun station such as from Weller or Hakko. They are leaders in this area. Recent soldering stations come with digital displays that show the tip temperature and allow the user to control the temperature during the job. Applying right temperature is extremely important while soldering delicate parts such as PCB. An excess heat can damage the PCB tracks easily. We recommend you to go for a soldering station that has feature of adjustable temperature control (and preferably has a digital display).